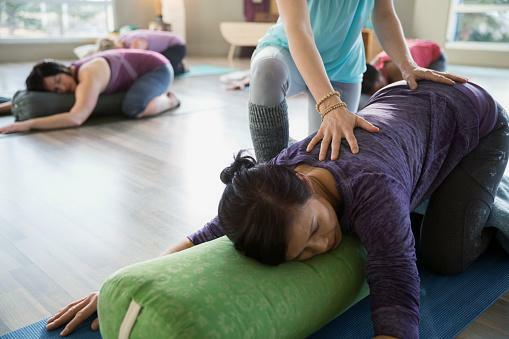 If you suffer from frequent headaches, try these yoga poses to help reduce tension and pain. The best selection combines relaxation techniques with asanas that release the muscles of your neck. Get ahead of the pain by practicing as soon as you feel pressure coming on. When stress has your mind occupied with thoughts that make you anxious or frustrated, the tension can build. You need a way to bring focus back without too much effort. Bridge pose is the way to go. It may seem counterintuitive since this pose applies pressure to the back of your head. However, you may be surprised to find that it has a calming effect. Hold the pose for eight to ten breaths, then rest for five breaths with one hand on your belly and the other on your heart. If you have the opportunity to sneak away for a quick power nap, corpse pose is an ideal option. All you have to do is lay down on your back, with your arms along your sides, palms facing the ceiling. Make it more relaxing by covering your eyes with mask or a folded towel to block out the light. Set a timer for 10 to 20 minutes before easing out of the pose. Make this pose even better by pairing it with a guided audio meditation. The great thing about a standing forward bend is that it can be performed almost anywhere. The forward fold is known for its role in stretching the hamstrings, but it also helps clear the sinuses. To perform it, just hinge at the hips, releasing your torso toward the floor. Feel free to let your arms dangle or alternate shrugging your shoulders to lengthen the muscles of your upper back and ribcage. Stay in your bend for ten full breaths before moving on. It's easy for neck tension to build up during a busy day. You can release it with a simple head tilt. Begin sitting or standing tall, with your shoulders relaxed. Tilt your head gently to the left, lowering your ear toward your shoulder. Place the fingers of the same or opposite hand on the right side of your neck, massaging up and down gently with long strokes. Do this for a minute or two before switching to the other side. You can also release the front and back of your neck by tilting your head forward or backward and providing the same light massage. Child's pose is a restorative asana that is often used to rest during a challenging practice or as an alternative to downward dog. Support it with a yoga bolster to help you relax. Separate your knees as wide as your mat and touch your big toes together. Sit your hips on your heels. Pulling your bolster close to you, lower your torso to rest on top of it. Hold this pose for up 10 minutes. Often considered an integral part of yoga therapy, rolling your neck muscles with tennis balls provides a self-massage to soften them. You'll need two tennis balls. For best results, place your tennis balls in a sock or small pouch, so they are flush to one another. Lay on your back with the tennis balls side by side, behind your neck. Rotate your head slowly from left to right. A small motion will do. Spend about 10 to 30 seconds in one spot before moving the balls up or down your neck. Go as high as the base of your skull and as low as the top of your shoulders. Yoga Nidra is the systematic relaxation of the muscles of your body. With headache pain, the focus should be on softening your face, neck and jaw, which you may be gripping without knowing it. The more you focus on the pain while experiencing your headache, the worse it will get. Instead, focus on reducing tension. These yoga poses should help you do just that, thereby diminishing associated pain. To achieve better results, allow yourself to relax during the process.